NARC N Scale Pullman Standard 5077cf. 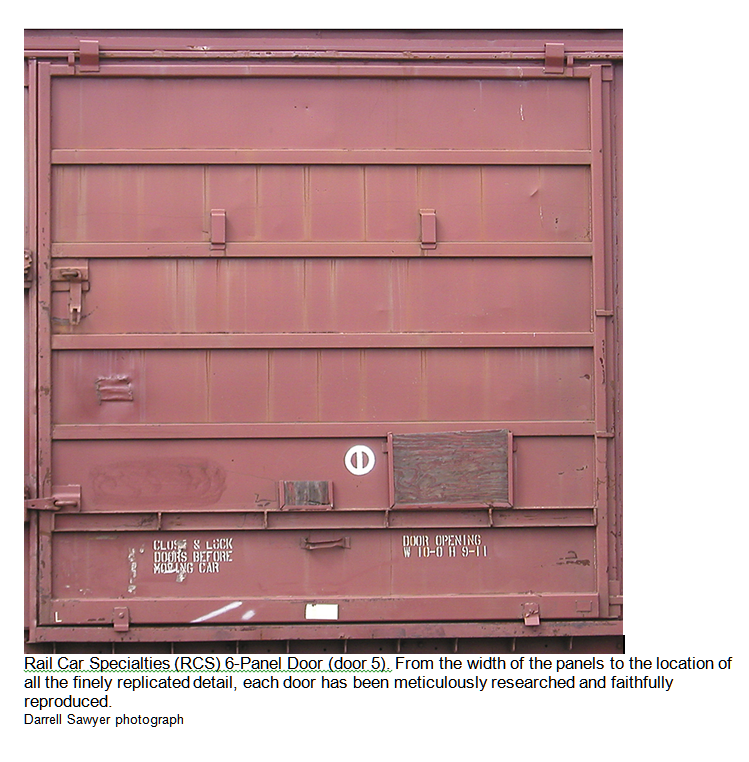 50' Single Door Boxcar 16 Roads!!! 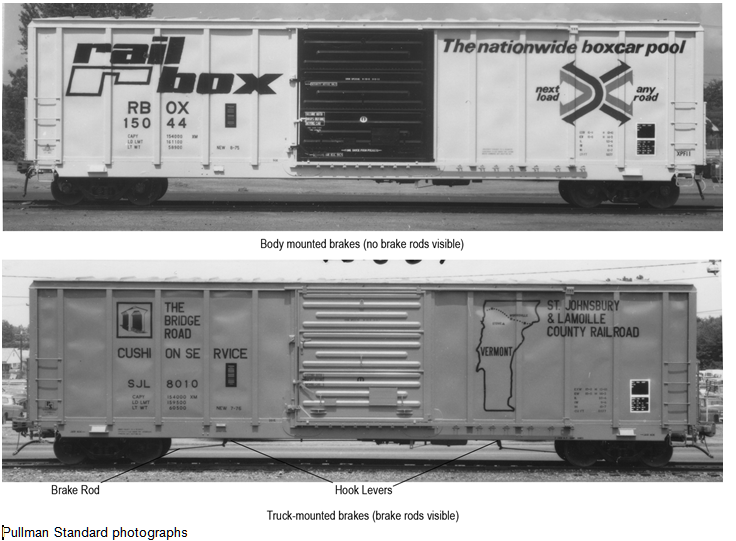 We are VERY pleased to announce that ALL of the drawings are now accepted and approved for the PS 5077 box car project! It's been a long haul and now it's time to start cutting metal. We are offering 35 versions (HO) of this car (not including paint schemes), when you take into account all the detail differences. No matter what era you model between October 1972 and today, or what area of North America you model, there are cars in this project you need to accurately reflect traffic on your railroad. We want to thank everyone at our factory in China for their excellent effort in getting this project to this point. We also want to thank our customers that helped the project by providing photographs and feedback as the design phase moved forward. We've had a few issues along the way related to making sure the plans were correct and by taking the time necessary to research the issues to be sure we got details right, we think the time and effort will be well worth it. We think you will, too. We are really proud and excited with the level of detail and accuracy that our factory and their team have been able to incorporate into this very complex project. No one has ever done anything this complex in a model freight car project before and we truly believe that you, our customers, will not only be impressed with the end results once you see them in person and online. What was so complex about this project? 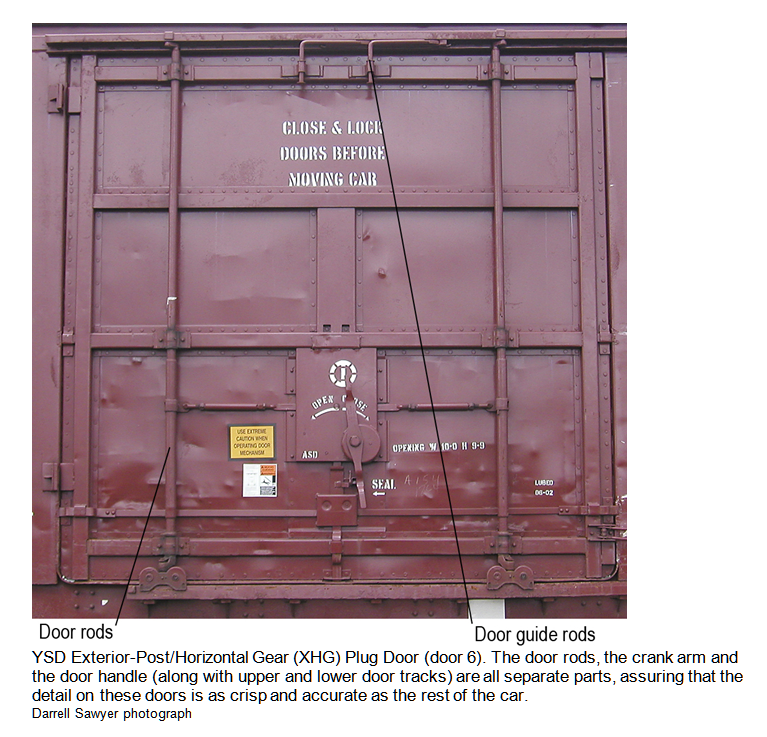 There are multiple bodies (2), ends (4), side sills (5), underframes (2), doors (8), upper door tracks (3), lower door tracks (3), door stops (5), logo plates (3), door opener wheels (3), hand brakes (3), stirrup steps (3) and roofs (2), covering all the original production variations, plus modifications made to the cars later in life, like plug doors or extended roofs, doors, modified ends and multiple vent styles for baled wood pulp loading. To date about 40% of all the cars are pre-sold, so it's time to get your orders in for this exciting, game changing car! We will now move to the next step (cutting the moulds) and we are really looking forward to seeing samples! We hope to have the test samples in 4-5 months. You are already familiar with our first project, the never before produced Hawker Siddeley 4550 cf. 4-Bay Cylindrical Hopper, presented in 2009 to coincide with the introduction of the brand new Government of Saskatchewan green Tiger Lily paint scheme. We went beyond industry standards as we produced this car, and other roads using Hawker Siddeley 4-bay hoppers, in 15 different body variations. In 2013, we brought the 4000 cf. Coal Gondola, to the modelling world in 4 versions: Hawker Siddeley Trenton; National Steel Car; Marine Industries Ltd; and CN Transcona Shops. Here, too, we produced each road name with the minor variations needed to make each model unique and prototypically accurate. 2016 saw the introduction of the National Steel Car Potash Service 4275 cf. 3-Bay Covered Hopper, complete with 7 different body variations. Once again, North American Railcar Corporation has pushed industry standards, with the newest addition to our proud line-up of high quality model rail cars! These have already been done. Didn't Atlas make this car in HO scale? We asked our director of research: "Aren't these cars the same?" His comment was: "Are 5 Litre Ford Mustangs the same as 5 Litre Chevy Camero's?" So then why would an FMC 5077 be the same as a PS 5077? These cars have never been done before, there are numerous paint schemes, and they are seen all over North America. 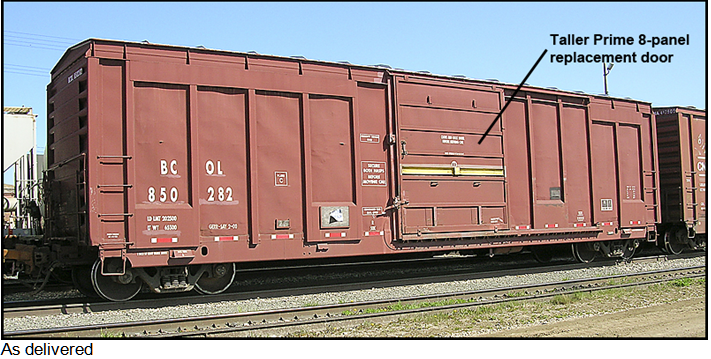 Our Boxcars are 5077 cf. 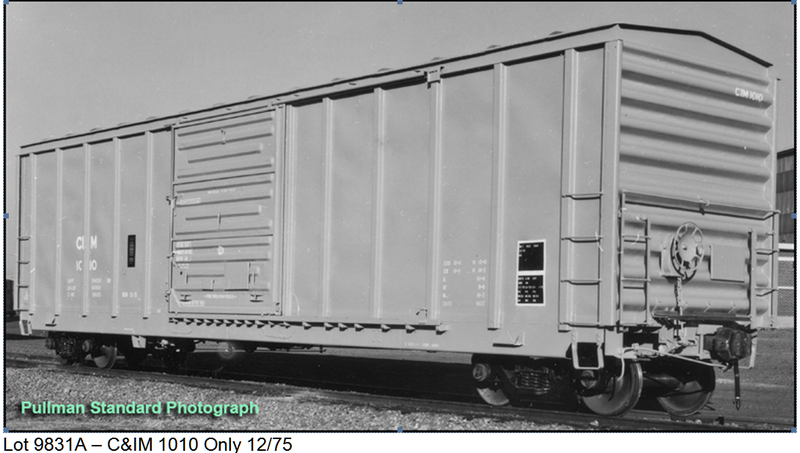 Pullman Standard built 4,301 5077 cubic foot plate B box cars with sliding doors between October 1972 and August 1979 for seven original customers. In addition, Pullman supplied a total of 300 superstructure kits (car bodies and doors - Berwick Forge and Fabricating supplied the underframes) to Golden Tye at Pickens, South Carolina for assembly during 1975-76 for the National Railway Utilization Company (NRUC). 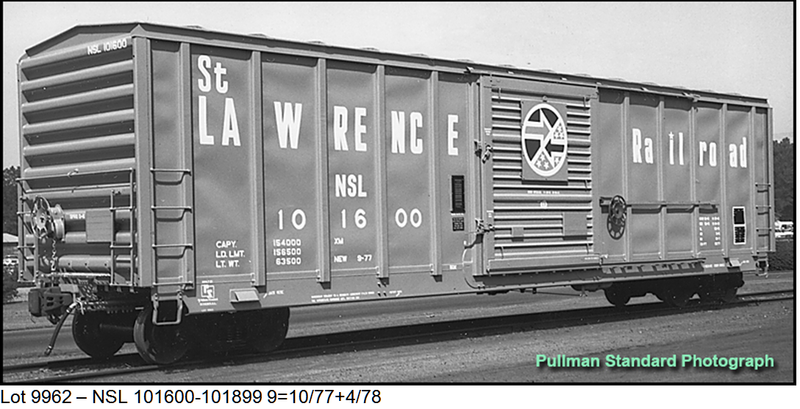 These kit cars were originally operated by St. Lawrance Railroad and Pickens Railway with NSL and PICK reporting marks during the IDP boom. 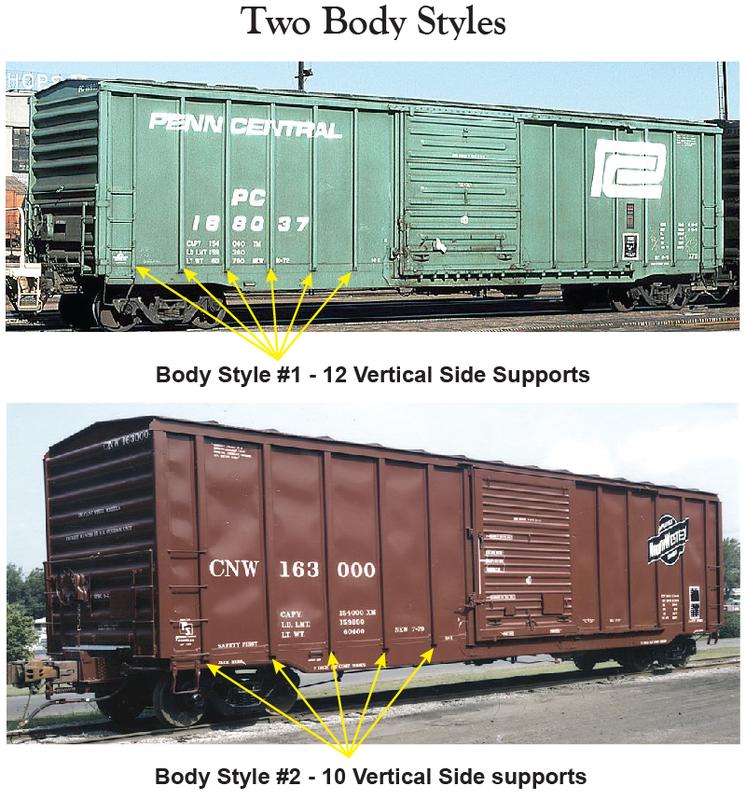 There were two basic body styles incorporated during the PS production run, both incorporating ten foot wide door openings. The first body utilized twelve side posts. The first post, with the inboard ends of the grabs attached was a “Z-post” section while the remaining side posts were “hat” sections. 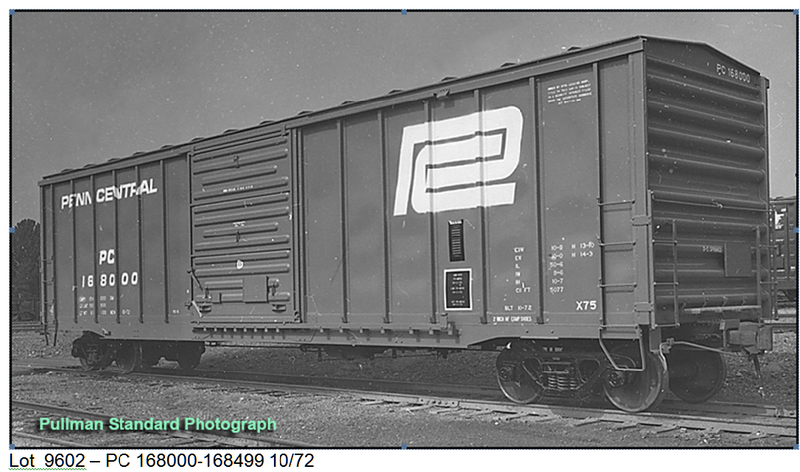 The first body with twelve side posts was utilized only on the original order, Lot 9602 for Penn Central. 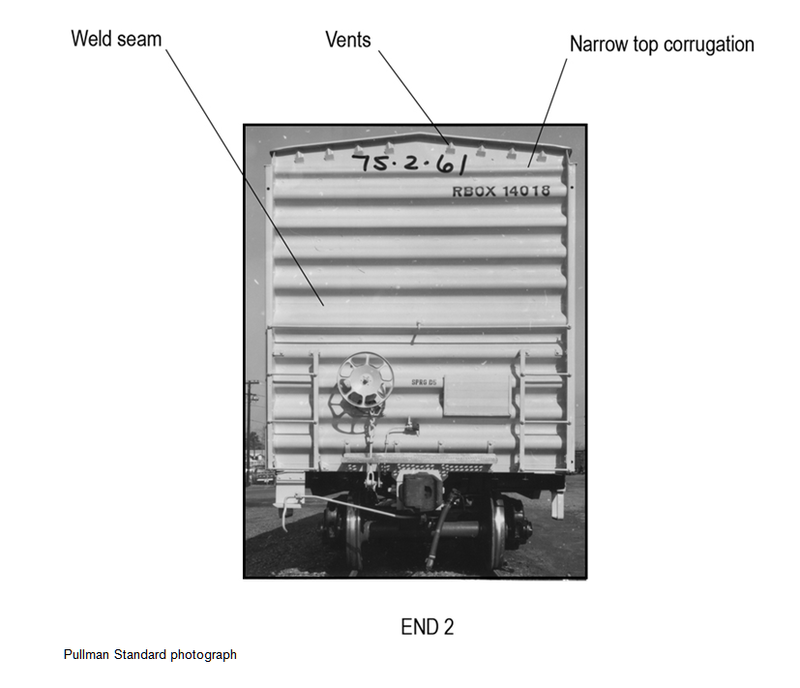 The second body style utilized on all of the following 5077 orders was modified to include only ten side posts, all of them constructed from slightly wider “hat” sections of steel channel. Pullman supplied the car bodies and appliances for the kit-built cars for NRUC, so the body is identical to the PS-built cars. There were four side sill variations employed by Pullman over the five year production span. The first sill was fabricated from L-angle, with the narrow leg at the top of the sill and a notch cut out at each end for access to the trucks. The next five orders were delivered with side sills fabricated with plate steel with the lower edge bent into an L-shape, with a notch at the stirrup steps. The final order was delivered with a side sill similar to that on the second order, with the difference being there is a radius along the lower edge. On the PS-supplied kit cars, the side sills (along with the bodies) were supplied by Pullman and look like the typical Pullman side sills on 5077 cubic-foot cars. But, since the underframes were supplied by Berwick Forge and Fabricating, the location of floor joists differed from the Pullman underframes and therefore the Huck bolts that fasten the underframe to the side sill are in different locations on the two different versions of the similar sills. Now, who else would go to the trouble to reproduce this kind of detail? Five different side sill variations! 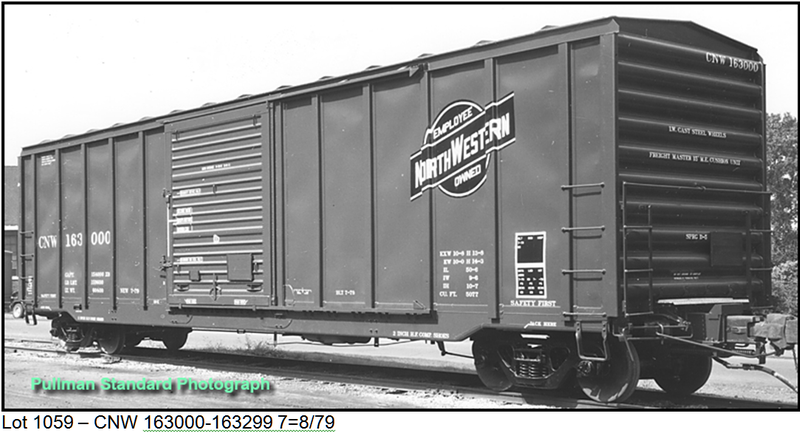 Again, North American Railcar is providing all five side sills, applied to the appropriate cars to match the prototype. We’re thinking outside the box! For all the orders, with the exception of one, Pullman equipped the cars with their proprietary 15-panel "bow-tie" roof. The PS-supplied kit cars were also delivered with the bow-tie panel roof. The one exception was the order for NRUC (NSL), which cars were equipped with Stanray's 15-panel "diagonal-panel" roof. We’ve even included the seam cap rivets on both roofs. No detail is too small to overlook! 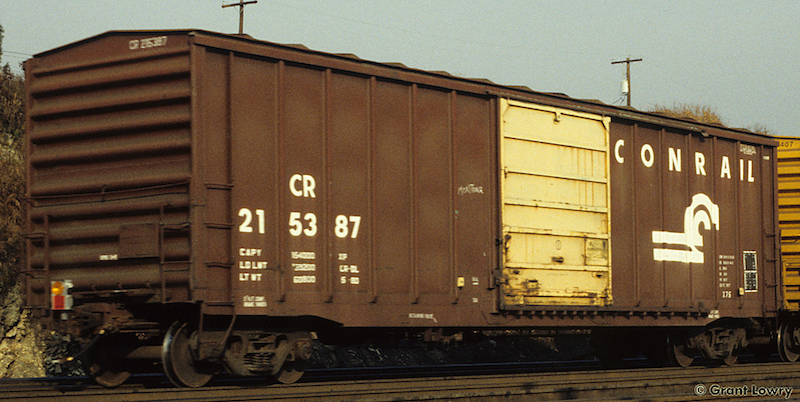 North American Railcar has even tooled a roof extension so that three series of these cars, modified for baled wood pulp and paper service can be accurately modeled. This is another first! Plus, when cars were modified for baled wood pulp and paper service, the car ends were reinforced by welding plates between the corrugations, protecting the ends from damage when pulp bales or paper rolls shift. 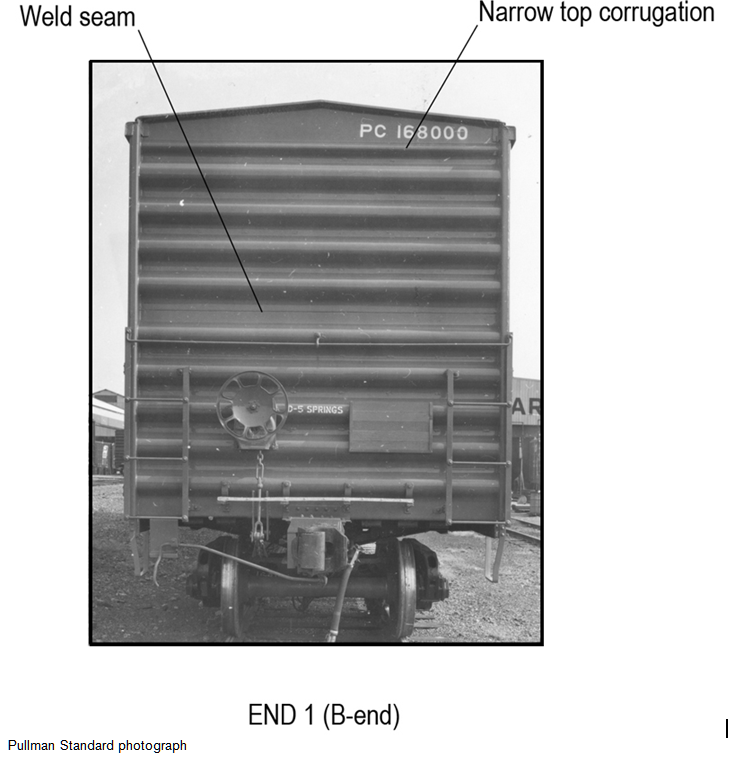 North American Railcar is providing all three original end variations, appropriate for the order depicted, plus, the reinforced 5/5 “sine-wave” end that was modified for pulp and paper service. 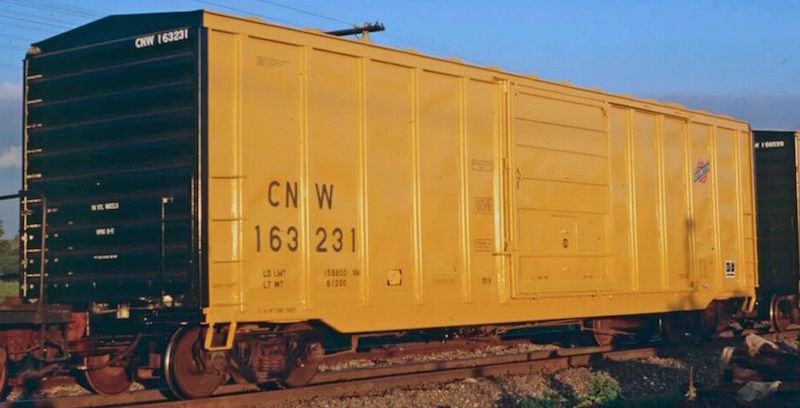 No one else, before North American Railcar, has been able to offer multiple, accurately detailed ends to their freight car reproductions and still keep them competitively priced. Pullman delivered most of these cars with their own proprietary embossed panel doors. 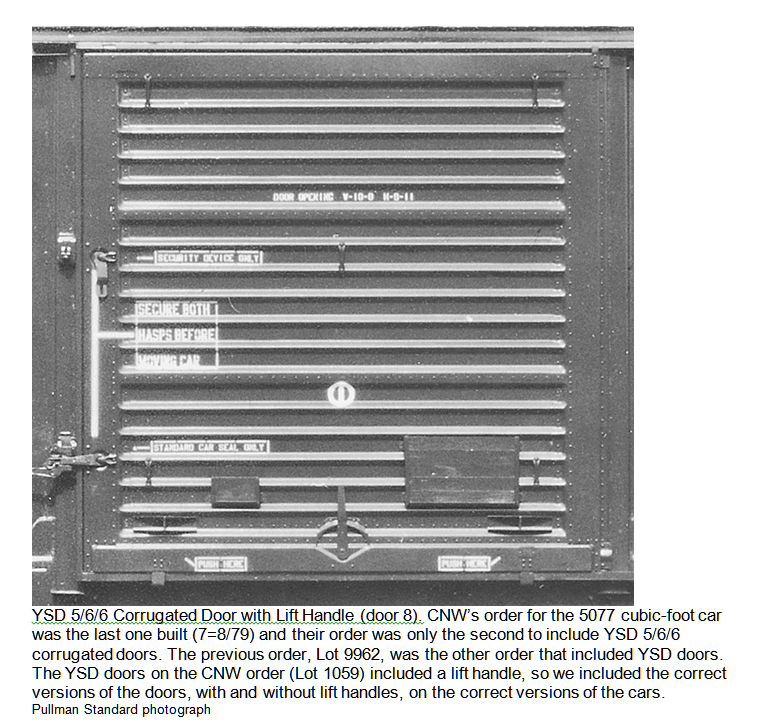 However, two roads (NSL and CNW) chose their cars to be equipped with YSD 5/6/6 corrugated doors, which differed slightly in details between the two orders. BC Rail and Canadian Pacific had cars from two lots modified for pulp and paper service in 2000 (BCOL) and 2002 (CP). The modifications included increasing the capacity to 100-tons, raising the roof, applying stiffeners (plates) to the ends, installing vents along the floor and roof lines and installing taller doors. 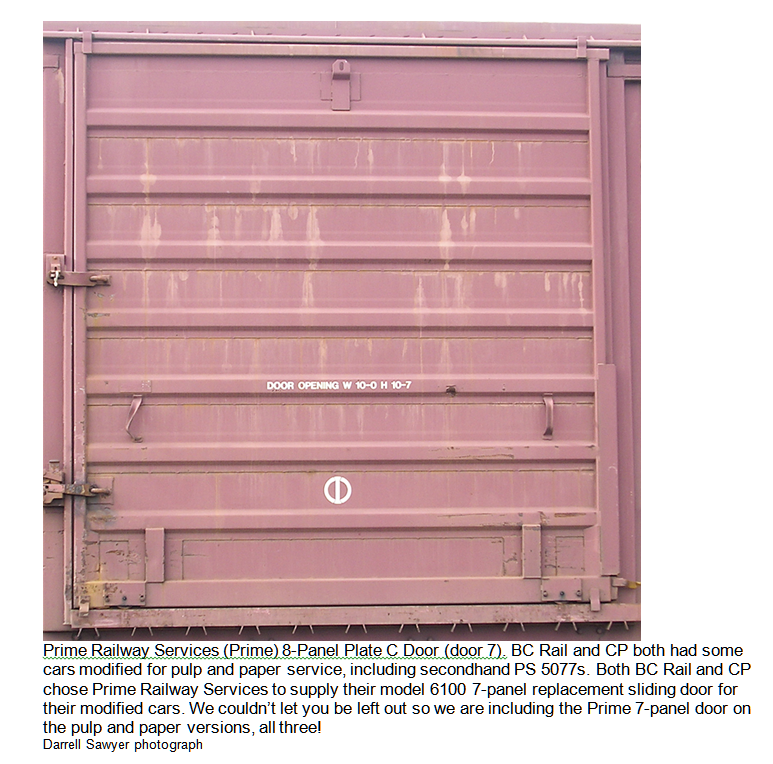 Lot 9602 car, CP 214456 (nee-PC) has been modified for baled wood pulp and paper service by raising the roof and adding vents along the roof and floor lines to allow moisture from the warm, wet pulp bales to vent outside, keeping the interior of the car drier, reducing rust and related issues. 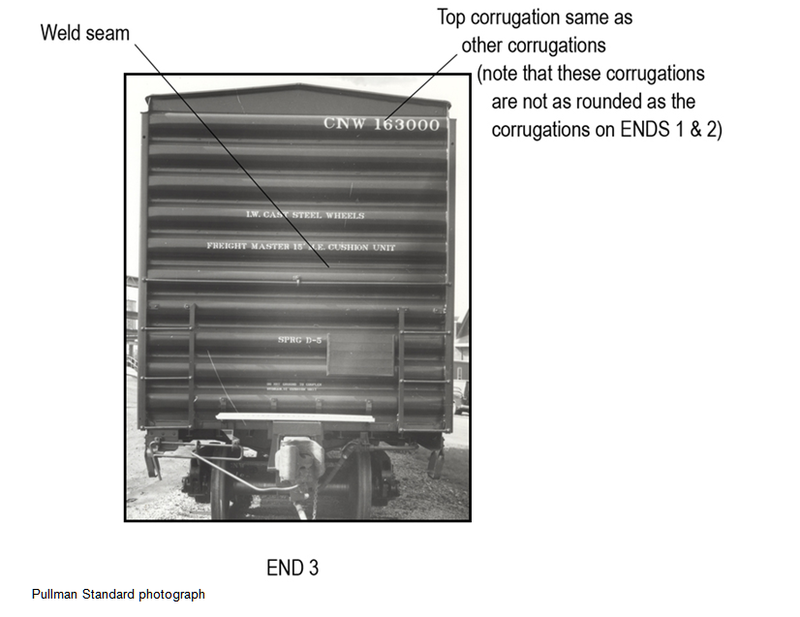 The ends have aslo been modified by welding nine strips of steel between the corrugations (see the close-up above, in the ends section) to help resist damage from shifting loads. The original 70-ton trucks with 33” diameter wheels have been replaced with secondhand 100-trucks with 36” wheels and the bolster and underframe have been upgraded to handle the increased load limit. The original PS embossed door has been replaced with a taller, plate C Prime 7-panel door to go with its raised roof. This version is faithfully reproduced in HO scale by North American Railcar and these cars are seen all over North America, hauling baled pulp, rolls of paper or building materials such as plywood, particle board or oriented strand board. Lot 9831 car, CP 214870 (nee-RBOX) has been modified for pulp and paper service as well. All three versions were modified slightly differently. The CP cars were all modified at Alstom Transport Services, Calgary, Alberta. Compare the vents on the three different cars. 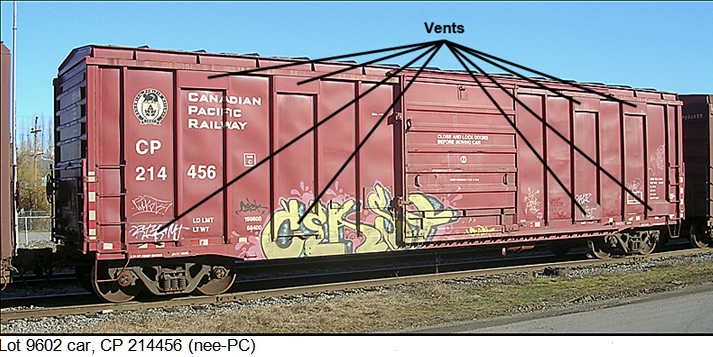 North American Railcar has faithfully reproduced all the various vent designs (upper and lower) and applies them accurately, based on photographs. We don’t just break the mold by including vents, we hand apply the correct size vent on the correct cars! 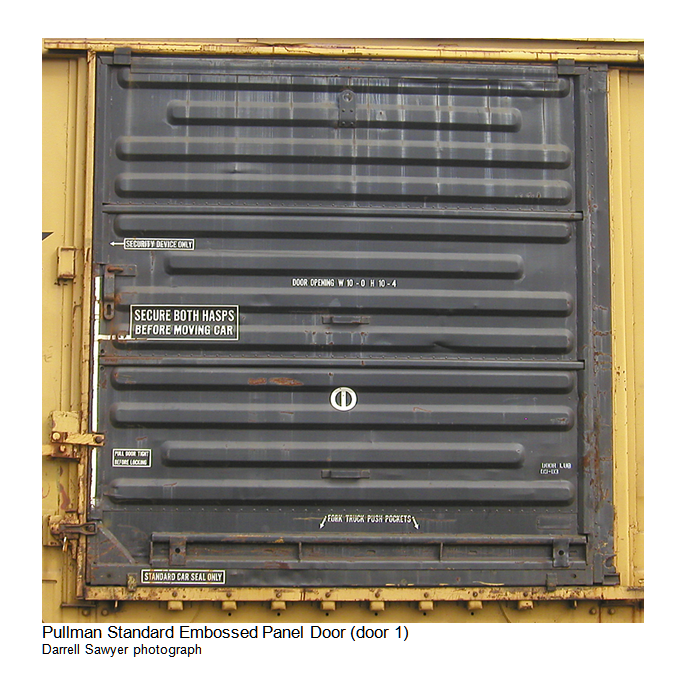 As delivered, all the Pullman Standard 5077 cubic-foot cars came with doors that covered a 10-foot wide by 9-foot, 11-inch wide opening. The cars modified for pulp and paper service got their roofs raised by 5-inches (from 10-feet, 7-inches to 11-feet) which increased the height of the door openings by 8-inches (from 9-feet, 11-inches to 10-feet, 7-inches). 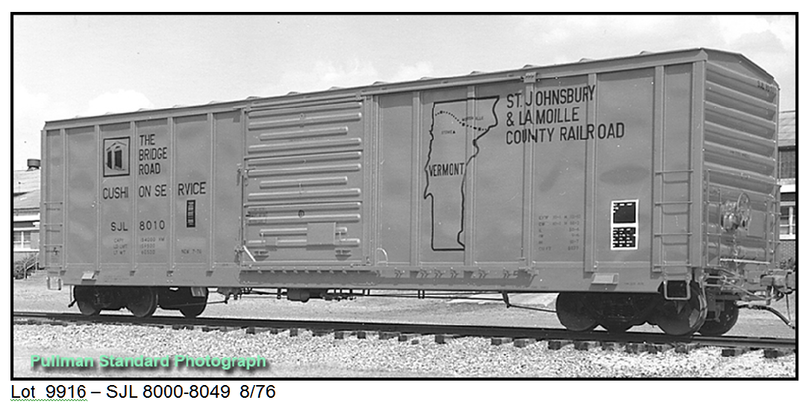 North American Railcar is replicating these cars by providing cars with a roof extension, stiffened ends, 3 different side vent styles, the taller Plate C Prime 8-panel doors and 100-ton Barber S-2 trucks. Who would have thought that you’d be able to roster such unique cars on your layout without having to resort to brass, resin kits or a major kit-bashing or scratch-building project? 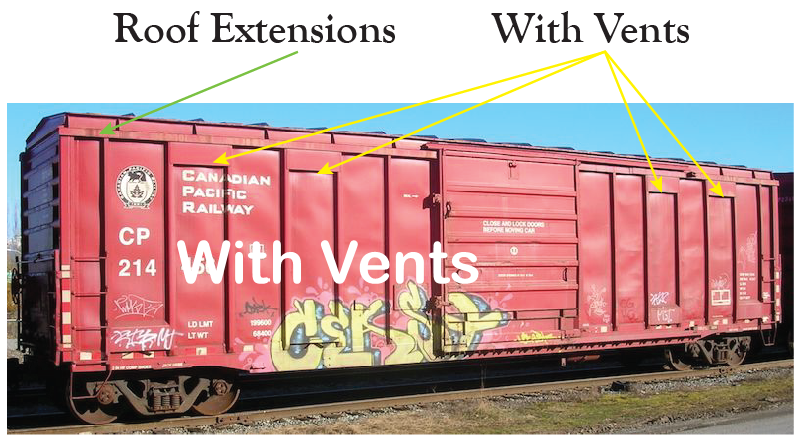 Only from North American Railcar! Because of North American Railcar's modular approach to tooling, we can offer a variety of detail part options and still keep assembly costs competitive. 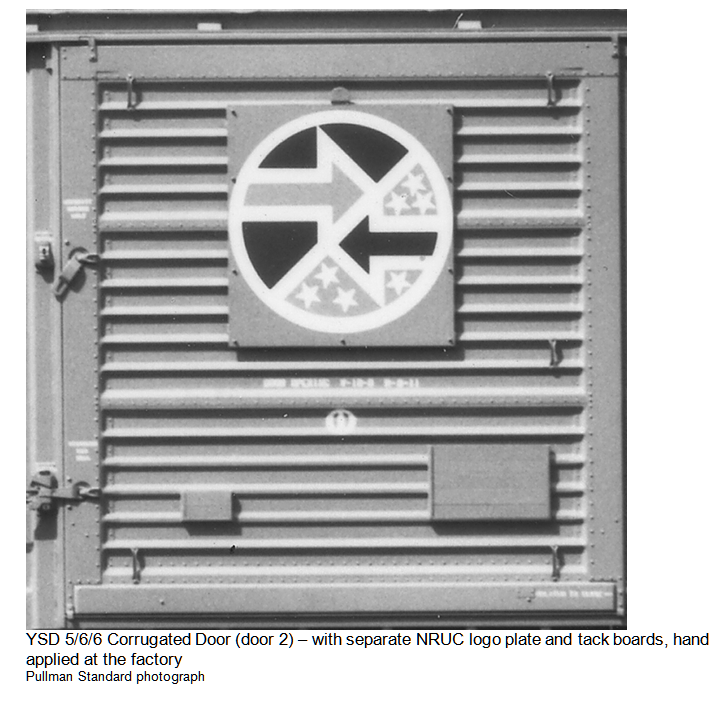 For example, as mentioned, the doors are all separate parts instead of cast-on. 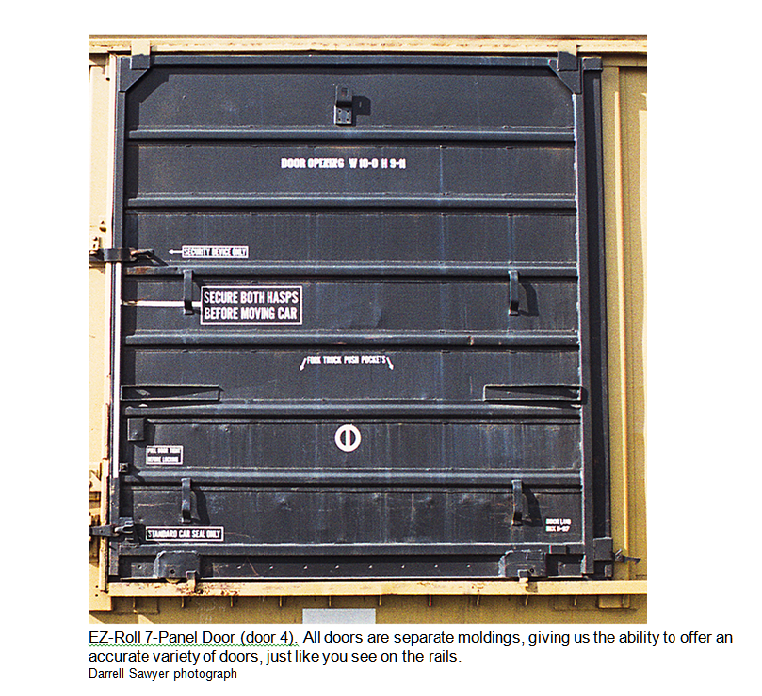 While this approach increases our up-front tooling costs, we can later use these doors (and other detail parts) on other box car projects, saving future tooling costs, which means higher detail and more variety for you, without you having to pay more for your highly detailed, super accurate freight cars. The hand brakes equipped on these cars were provided by Ajax, Ellcon-National and Universal. Naturally, North American Railcar is applying the correct hand brakes as were applied to the prototype cars, based on photographic evidence. Who else would do that for you? North American Railcar has tooled an all new ASF 70-ton Ride Control roller bearing truck with free rolling scale 33" diameter wheels and rotating bearing caps to accurately match the trucks that were delivered on the prototype cars. With a magnifying glass, you can even read the foundry data cast onto the side frames! After a number of years in service, some cars were modified and equipped with 100-ton trucks with 36” diameter wheels. North American Railcar will include our highly detailed, very free rolling Barber S-2 100-ton trucks on appropriate models to match the prototype. Two different brake system options were available on the Pullman Standard 5077 - horizontal and vertical brake levers. Four orders were equipped with the horizontal brake lever version while three orders were equipped with the vertical brake lever (hook and eye) option. The kit cars were provided with horizontal brake lever systems, and of course, North American Railcar will provide the correct version for each order modeled. Pullman equipped these cars (as a customer option) with either rigid draft gear (coupler boxes), or draft gear with 10" travel end-of-car cushioning units. Later, some secondhand cars were modified with 10” end-of-car cushioning. 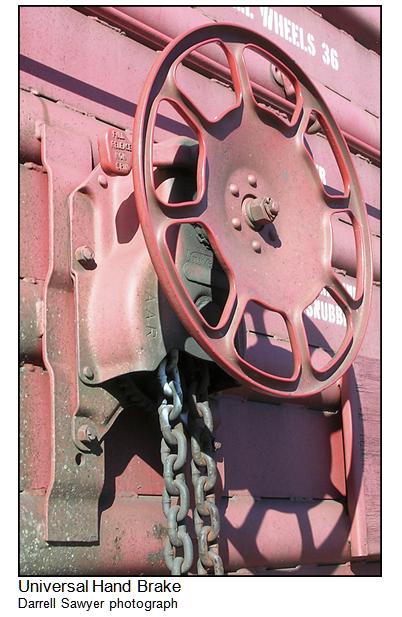 Of course, depending on the order, the appropriate draft gear will be applied by North American Railcar. Our customers have told us that they’d like to see future releases come out with “semi-scale” draft gear. Well. 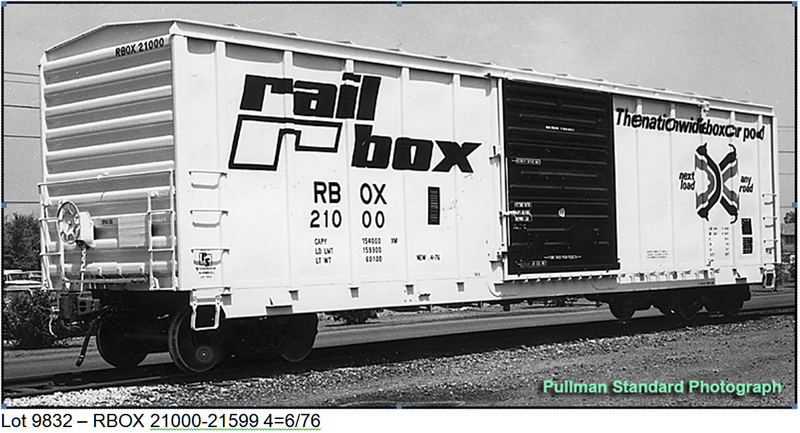 The Pullman Standard PS5077 box car is the first North American Railcar model with semi-scale draft gear. We listen to our customer’s feedback! 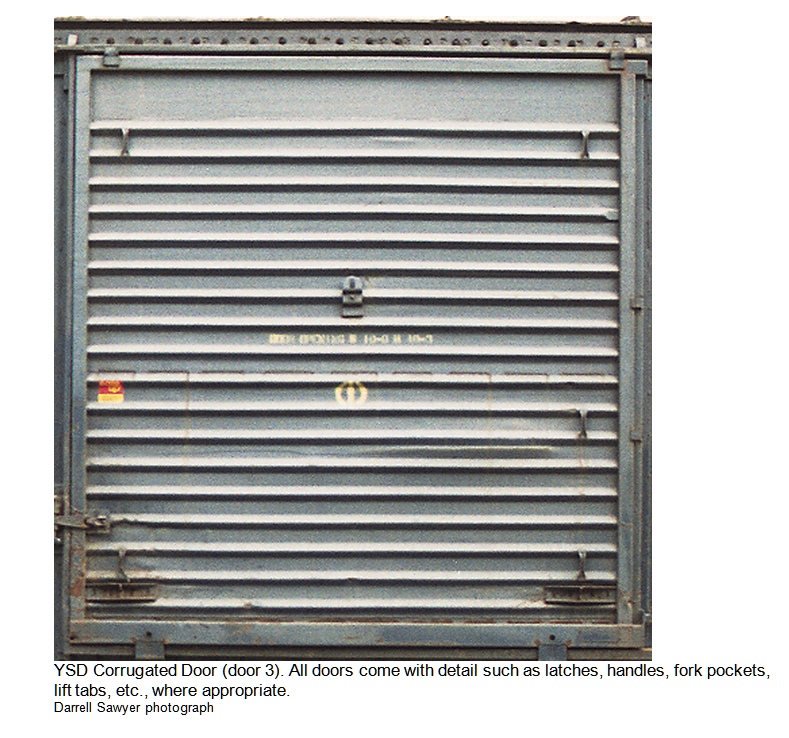 North American Railcar Corporation is NOT skimping on individually applied detail parts. 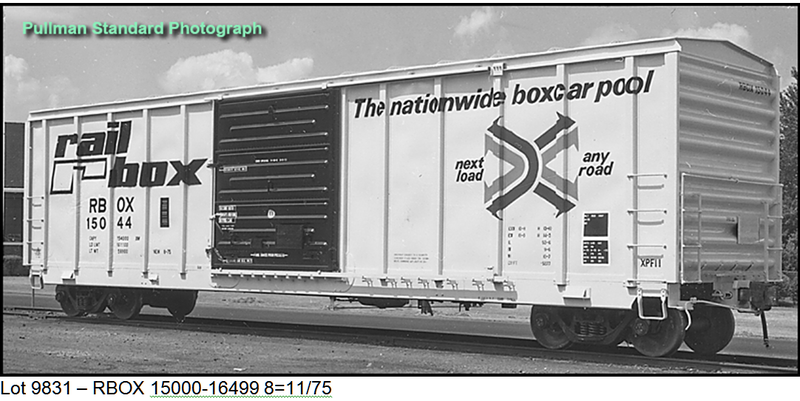 This isn’t your Grandpa’s 1990s freight car model! There are very few details cast onto this car. The roof is separate. The doors. Plug door rods and crank arm are all separate. The upper and lower door tracks. Upper door stops. Hand brake housings. The hand brake wheels, separate. Bell cranks. The etched metal end crossover platforms. The stirrup steps. Ladder stiles. Ladder rungs. All individually applied by hand. Coupler boxes and covers. 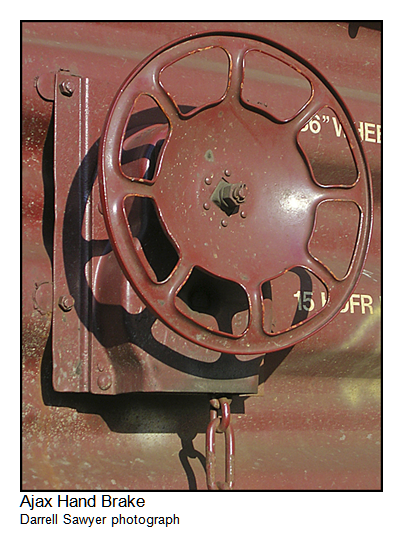 Door opener tracks and wheels. The underframe brake rigging. Brake hangers. Brake release rods and hangers. Brake rods. Air hoses. See the pattern? If it’s a separate part and it’s interchangeable on the real car, then it probably is on the North American Railcar model! Speaking of stirrup steps, we’ve tooled three different styles of stirrup steps. These are finely detailed steps, complete with rivets where required and separately applied to the car at the factory. 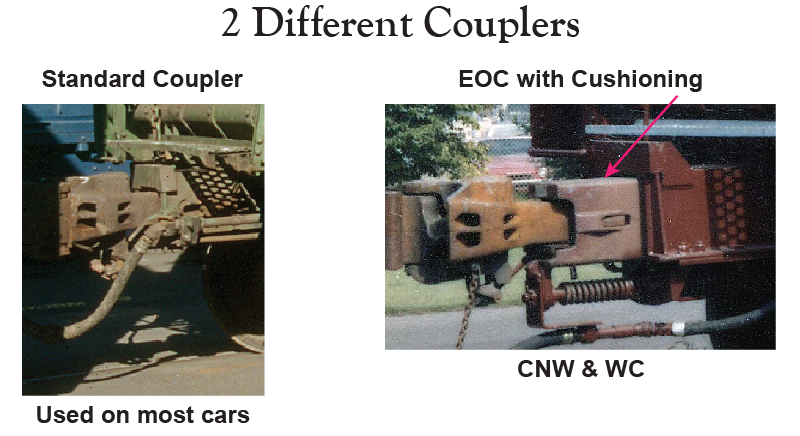 And did we mention the two different styles of bent wire coupler cut bars? One style for cushioned and one style for non-cushioned cars! And the bent wire ladder rungs? All 32 of them hand applied. And the door tracks! Both upper and lower door tracks are super detailed, separate parts. But there’s not just one style of door track on the real cars, so there’s three different styles of door tracks, depending on the car modeled. And of course you need door stops to keep the doors from running off the end of the tracks. Like the prototype, we’ve tooled five different door stops! Now, how’s that for prototype fidelity? Some second-hand cars were modified with plug doors and some with end-of-car cushioning. 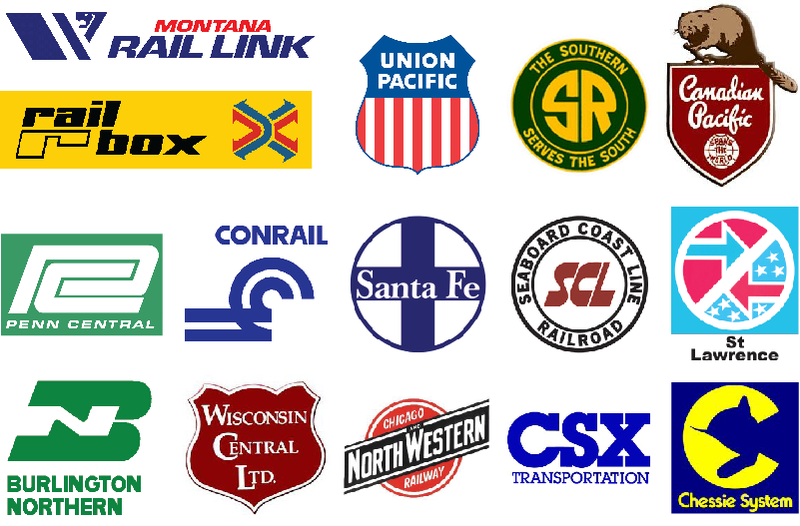 North American Railcar is making these options available to you as well, decorated for the appropriate roads. We’ve got a car for everyone! 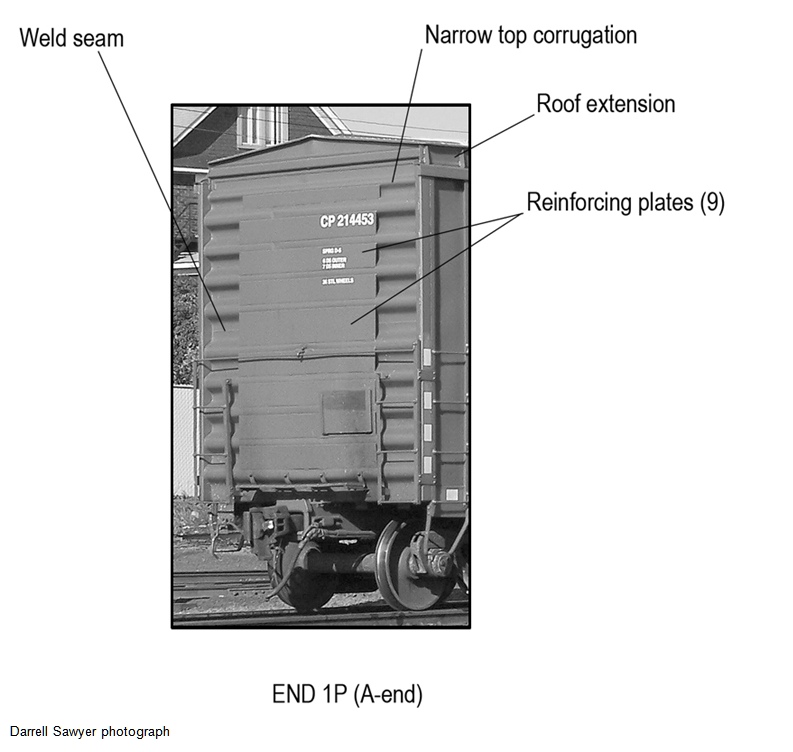 PWRS/NARCorp is tooling this iconic Pullman Standard 50 ft plate B boxcar with all the various side sills, ends, roofs, hand brakes and steps, plus the various door styles, for a total of thirty-five versions to be produced! Nobody else could get away with doing thirty-five variations of a car in plastic and still keep the price the same or lower than other comparable cars on the market. These cars were seen all across North America starting in 1972 and some of these cars are still on the rails today. Each version of this box car has been meticulously researched and designed to incorporate many separately applied detail parts, including wire grabs, etched brass end platforms, plastic steps, ladder stiles, hand brakes, etc. Each car modeled will be equipped with all the correct details (body, side sills, steps, ends, hand brakes, roof, doors, underframes and trucks, etc.) based on photographs of that particular car. The paint and decoration has also been thoroughly researched and the cars are marked with super sharp graphics and accurate colors. You can even read the text on the trucks and hand brakes! 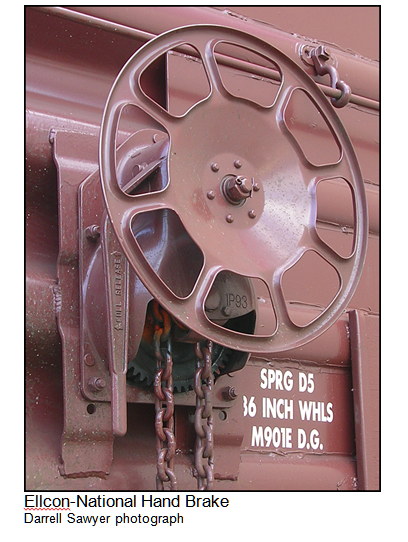 As is North American Rail Car practice, the Pullman Standard 5077 cubic foot box car is equipped with genuine Kadee #58 semi-scale couplers, NARCorp High Performance/Low Friction super detailed trucks with metal wheel sets for reliable operation. The cars weight was determined for smooth tracking and superior performance and meets NMRA standards. North American Railcar is pushing the envelope and offering model railroaders cars that they could otherwise never expect to be produced in plastic, in quantity. And at a competitive price! Stay tuned for upcoming images of pre-production samples. We meticulously research each and every model type, with all their variations. We design our cars, using builder's blueprints, to produce highly detailed, prototypically accurate models. We will not go to production until we are satisfied that we have achieved perfection.